Halloween is an exciting time for trick-or-treaters and the City's Neighbourhood Watch program and the St. John's Regional Fire Department want to ensure all the ghosts and goblins are safe while having fun. At Halloween, Jack o’Lanterns often become the target of vandalism, and 50 per cent of crimes reported to police on/after Halloween are crimes against property including Jack o’Lanterns. The City of St. John’s invites residents to participate in the second annual Pumpkin Walk at Bannerman Park on Thursday, Nov. 1, 6 to 8 p.m. Watch the video below to learn all details. 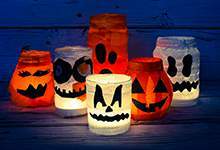 Bringing your Jack o’Lantern to Pumpkin Walk will curb Halloween-centered crime in your neighbourhood and is a great way to dispose of your pumpkin in an environmentally-friendly manner as the pumpkins will be composted and used in future landscaping projects.